An absolute riot for guests of all ages, our Caution Sticky Wall Rental provides endless laughs as participants climb the 21' tall inflatable sturcture and stick themselves to the velcro-lined walls in all sorts of ridiculous ways (including our personal favorite: upside-down!)! 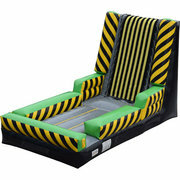 This Sticky Wall inflatable features the Caution theme, donned in virbant hues of green, yellow, and black, and it includes everything that you need to get going, including adult-sized and child-sized sticky suits. Add a layer excitement and hilarity to your next party or event with our Caution Sticky Wall Rental, and make your reservation today!